This web site aims to explain the historic origins of Calvinism, the principles of Calvinism and why Calvinism is at the heart of orthodox Christianity. There are few more misunderstood theologies than Calvinism. It is common for Calvinism to be seen as a narrow and mean spirited view that concentrates on a few passages from the Bible, passages that are both taken out of context and that distort the Christian Gospel. Everyone must judge Calvinism for themselves and as long as such a judgment is according to the revealed revelation of God it should be possible to see Calvinism for what it is, a reverent appreciation of the sovereign, holy and loving God. Calvinism is quite rightly identified with the theologian John Calvin, but the system of theology that Calvin promoted is perhaps better referred to as Reformed theology. 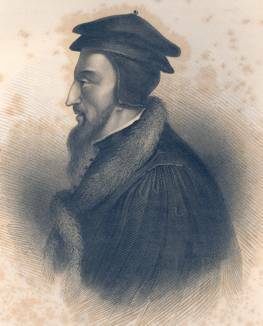 This is not an attempt to move away from Calvin but rather an attempt to recognise that what is seen as Calvinism (by both its supporters and its critics) is a theology that developed through the followers and students of Calvin and reacted to events subsequent to Calvin's immediate influence. This tradition became known as the Reformed tradition. This web site will seek to set out the principles underlying the Reformed tradition, the resulting theology and the implications of this approach. God Central to the Reformed view is a belief that the whole reason for existence is in order that God be glorified. Of the five sola's of the reformation there is none more important than "Sola Deo Gloria", or Glory to God alone. Other theologies concentrate of mans salvation, the reformed see this as only being of importance in so far as such salvation brings glory to God. Man If the Reformed has a high view of God it has a very low view of fallen man, even before the fall man was but a created being, albeit in the image of God, however after the fall man became totally corrupt and unable to reach to the divine in any way. Authority It is a mistake to believe that the Reformed do not accept the authority of tradition, however the Reformed do believe in "Sola Scriptura", that is by scripture alone. It is often said that this must be understood correctly as Sola Scriptura, not Solo Scriptura. Theology It is important to understand both what theology is and also why theology is important. The Church The Reformed view of the church is of vital importance and is connected with the great underpinning of Reformed theology, the central principal of Covenantal theology. Redemption The three sola's of Sola fide, Sola Gratia and Sola Christus bring together the single most important event of history. Faith, grace and Christ are central to the most mind blowing and amazing offer there has ever been, the Gospel of Jesus Christ. Conclusions Why is the Reformed position so relevant to the world today? Resources Texts and links related to the Reformed tradition. FAQ Common questions and responses about Calvin, Calvinism and the Reformed tradition.